With Jevan Snead, Colt McCoy and Sherrod Harris all competing to replace Vince Young as the starting quarterback for The Texas Longhorns, only time will tell who'll emerge as the leader. But if I had to choose one of them to go tubin' with me down some river... 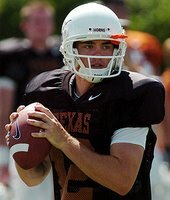 I'm definitely taking Colt McCoy. On Memorial Day, Colt and his father swam across a 300-yard lake and helped save the life of seizure victim and Texas football fan, Ken Harrington. "I knew I couldn't leave him," Patina Herrington said, "so I just started yelling for help." Colt McCoy and his father, Brad, were on the other side of the lake. The two swam about 300 yards to the other side, and Colt even lost his shoes in the water. Neighbors called 9-1-1, but McCoy put on his father's shoes and raced up a steep, rocky incline to flag down emergency rescue crews. "It was just a true hero story of how everybody came together and saved a life," Patina Herrington said. Oklahoma quarterback Rhett Bomar spent his Memorial Day weekend playing quarters and watching "Rescue 9-1-1". He also lost his shoes. Link to the story on Mack Brown's site.